Bill Beaumont To Leg It !! The former England Rugby Captain and Question of Sport TV star will be there to see the runners and walkers off at this year’s seafront run in aid of the Lytham St Annes Lifeboats to be held on Sunday 19th April 2015. The former rugby star, skipper of Fylde, England and the British Lions had a glittering career before injury forced him to retire early from the game in 1982. He is still involved with Rugby as a member of the RFU and the International Rugby Board. With his playing career over, Bill became a team captain on the BBC programme “Question of Sport” for 14 years, up until now the longest serving team captain on the quiz. He has supported the Lifeboat Service over many years and has kindly offered to start the Fun runners off this year from the Inshore Lifeboat House. The leisurely run was a great success last year. It will again take in views along the estuary and sea shore as it makes its way from the station’s Inshore Lifeboat (ILB) Boathouse on Central Beach, Lytham along the promenade to the station’s All-weather Lifeboat (ALB) Boathouse on South Promenade, St Annes where a BBQ will be held to revitalise the runners and helpers. The distance of the run will be 3½ miles / 5.63 Km so it is not planned to be too taxing unless an individual runner wishes to set a time. Walkers are equally welcome to come for a pleasant Sunday stroll. It is hoped that all ages will participate, even down to little ones in push chairs. The aim of the run is to give the participants a fun day out as well as to raise funds for the RNLI, the charity that saves lives at sea. At the start of the run the participants will also be able to view the ILB Sally in her Boathouse on the promenade at Central Beach (opposite the Queens Hotel) and at the finish the ALB Her Majesty the Queen in her Boathouse on South Promenade (“behind” the swimming baths). A tee-shirt will be presented to each participant. The cost for adults is £10 and for children £5. Entries may be booked on line at www.rnli.org/legit or entry forms are available at the station’s souvenir shops attached to both boathouses. 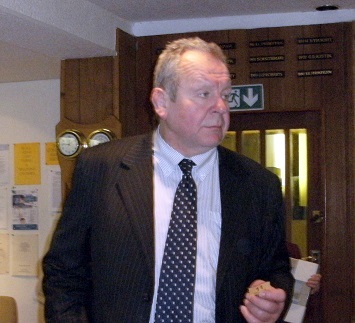 1) Bill Beaumont CBE at a previous fund raising event for the Lytham St Annes RNLI. The RNLI charity saves lives at sea. Its volunteers provide a 24-hour search and rescue service around the United Kingdom and Republic of Ireland coasts. The RNLI operates over 230 lifeboat stations in the UK and Ireland and has more than 200 lifeguard units on beaches around the UK. The RNLI is independent of Coastguard and government and depends on voluntary donations and legacies to maintain its rescue service. Since the RNLI was founded in 1824 its lifeboat crews and lifeguards have saved over 137,000 lives.